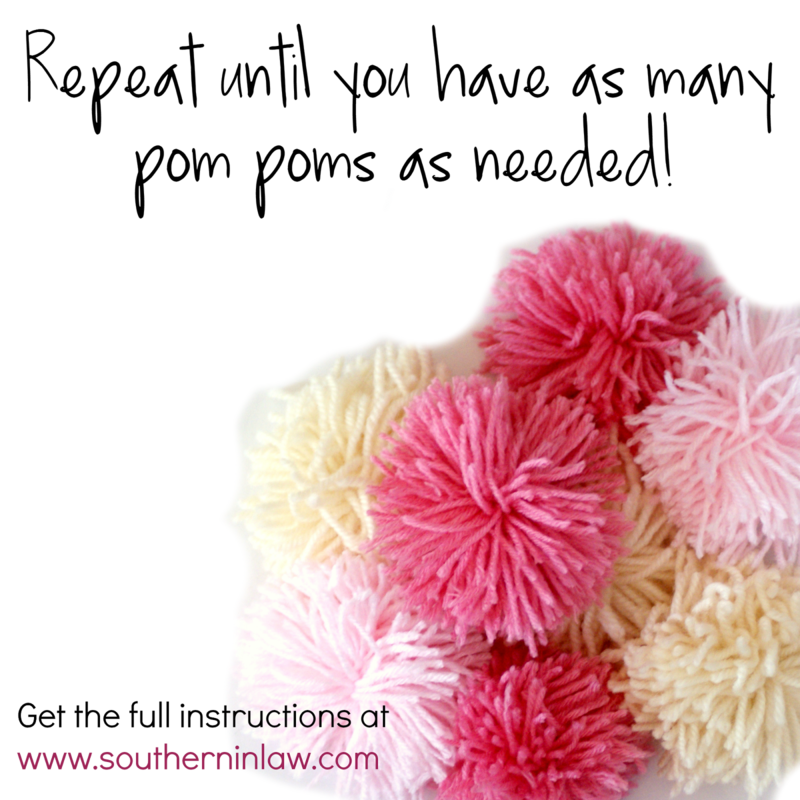 Southern In Law: How to Make a DIY Pom Pom Garland for less than $10! How to Make a DIY Pom Pom Garland for less than $10! I'm one of those people who likes to know how to do everything. Really, if there's something I don't know how to do I get frustrated and then make it my mission to learn how to do exactly that. It's a really bad character trait which sees me wearing a million and one hats - and it's also a character trait that sees me trying and failing to knit a scarf each and every winter. The drive is there - I buy my yarn, dig out one of the six hundred and forty two knitting needles I've collected over the past 8 or so winters and I get to knitting.... only to get twenty rows in, with blisters on my fingers and one too many dropped loops, and tuck my teensy wincey scarf segment into the bottom drawer of my desk to "work on later". Let me tell you... later never comes. This year, however, when I saw the awesome collection of yarn at The Reject Shop I knew I needed to make something with yarn - but I admitted defeat when it came to knitting and decided I had to figure out another yarn project to do instead. I decided to make POM POMS! In-fact, I decided to make a pompom garland - and I worked out the ultimate pom pom making method that's stupidly simple and seriously fast. Instead of taking thirty three years to make a scarf (based on my calculations of how much knitting I manage to do a year, I'm guessing thirty three years is a pretty good estimate), I made a gorgeous pom-pom garland in just a few hours whilst watching TV with Jesse - and you can too! Best of all, it will cost you less than $10! In fact, it could cost you even less, depending on how many colours you want to choose. First you want to buy your yarn. 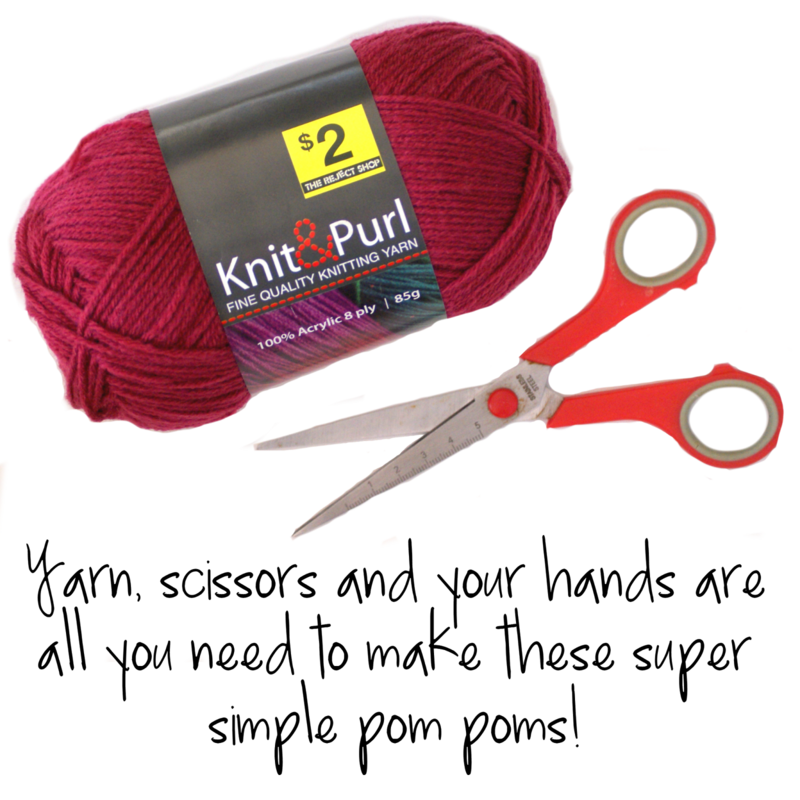 The Reject Shop have an incredible range of yarn in store for just $2 each! For this project, we choose four different colours; white/cream, light pink, pink and a darker pink/red colour. I'd suggest using yarn that's 8 ply and up for the best results. 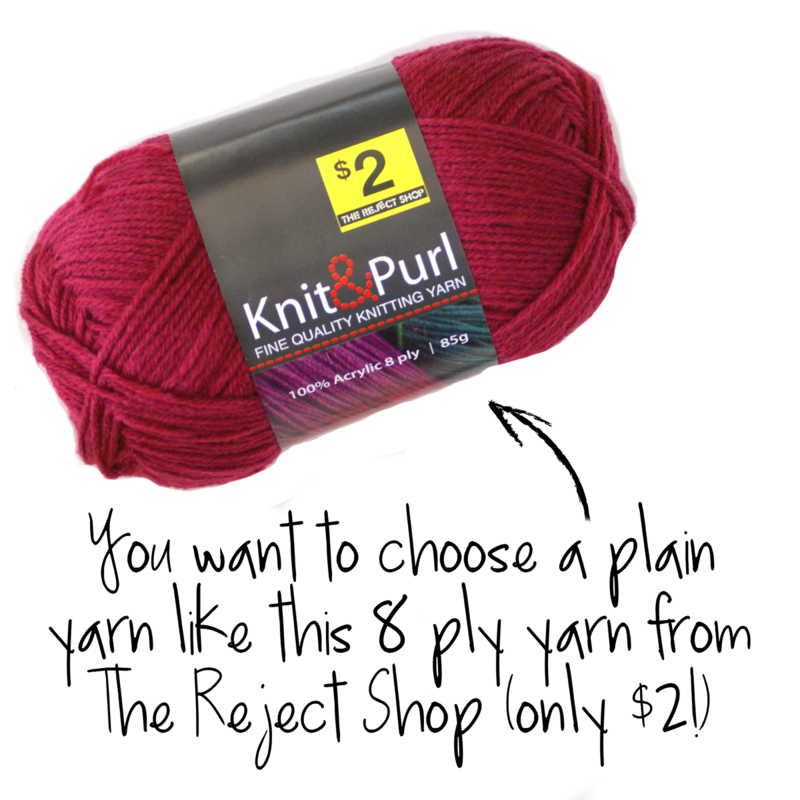 The thicker the yarn, the less you'll have to wrap it around to create your pom pom. For this project, don't use decorative yarns with tassles etc as they'll just get tangled up and you'll have a very odd looking pom pom at the end! Yarn in Colours of Your Choice.We used four different colours and found that each $2 yarn ball from The Reject Shop made around 8-10 pom poms. This isn't necessary, but it helps to make a somewhat fiddly job easier which I'll explain later! Our total cost? $8 for the 4 balls of yarn. Now it's time to make your pom poms! 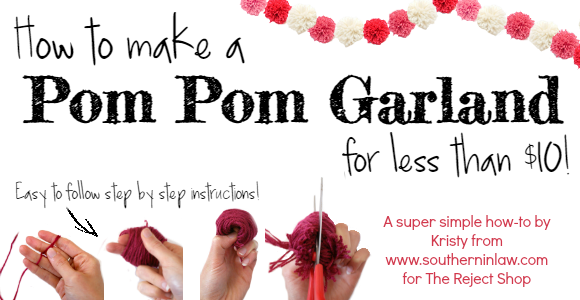 You'll be repeating this process to make as many pom poms as needed for your pom pom garland - but don't worry! It really only takes a few minutes to create a perfect pom pom. 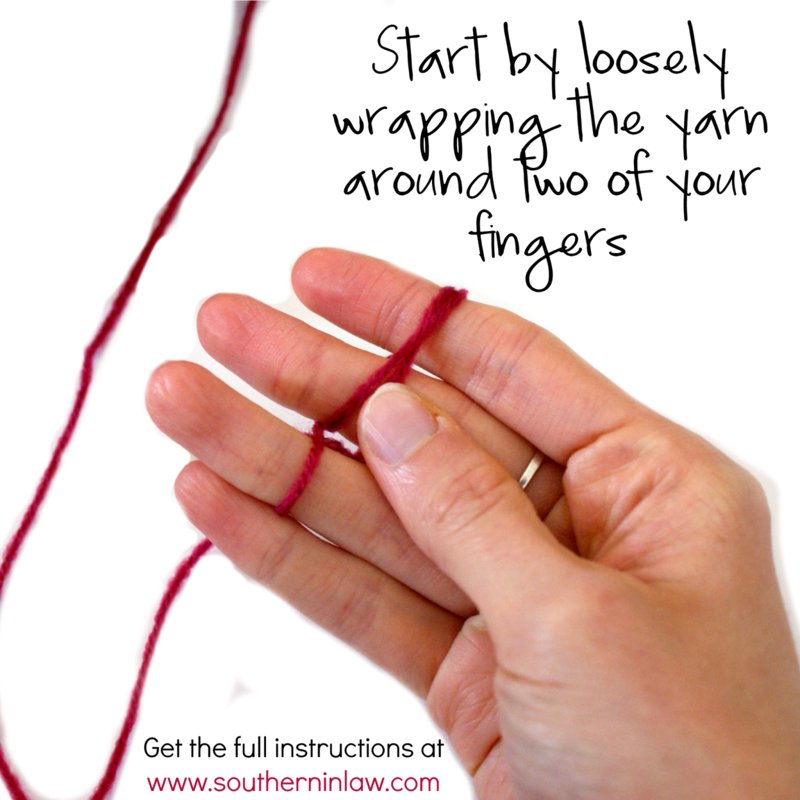 Start by loosely wrapping the yarn around two of your fingers. You don't want to wrap it too tightly as you'll struggle to get your pom pom off your fingers later and you also don't want to cut off your circulation. 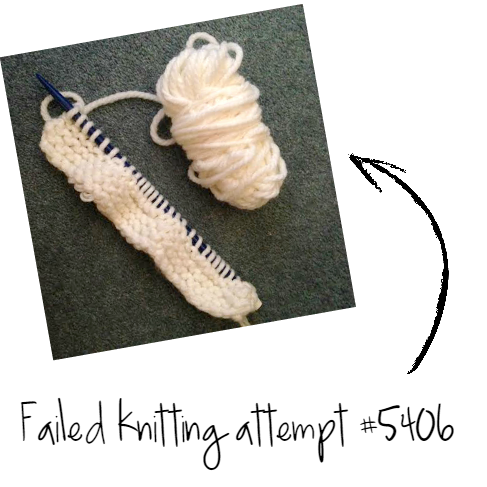 To start off with, hold the loose end of the yarn with your thumb so that it doesn't slip out of place. Now it's time to get wrapping. 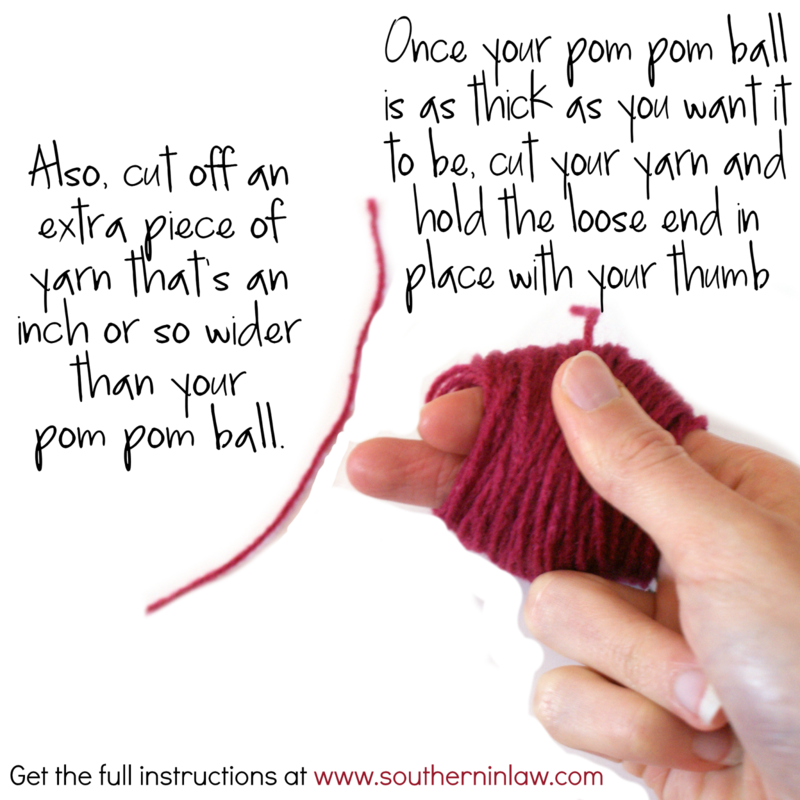 Wrap the yarn around your fingers until you reach your desired thickness. It will take a couple of practice runs to figure out exactly how large you want your ball to be for your pom poms, however, the thicker your ball, the fluffier the pom pom. 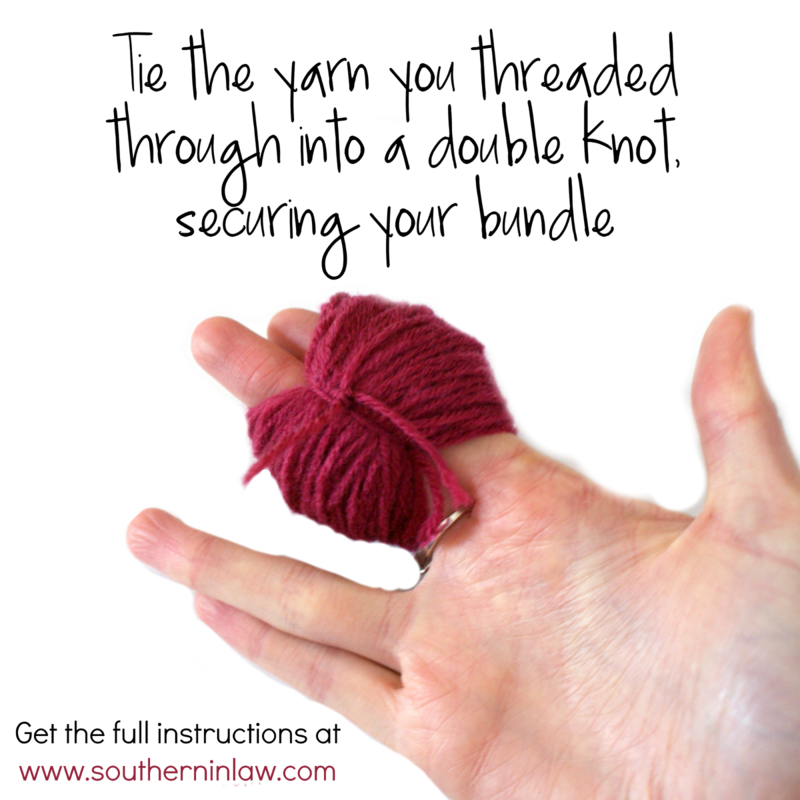 For the 8 ply wool, we wrapped the yarn 210 times around my two fingers. It sounds like a lot, but it takes just a minute or two. Now that you've done all the wrapping, it's time to form your pom pom! 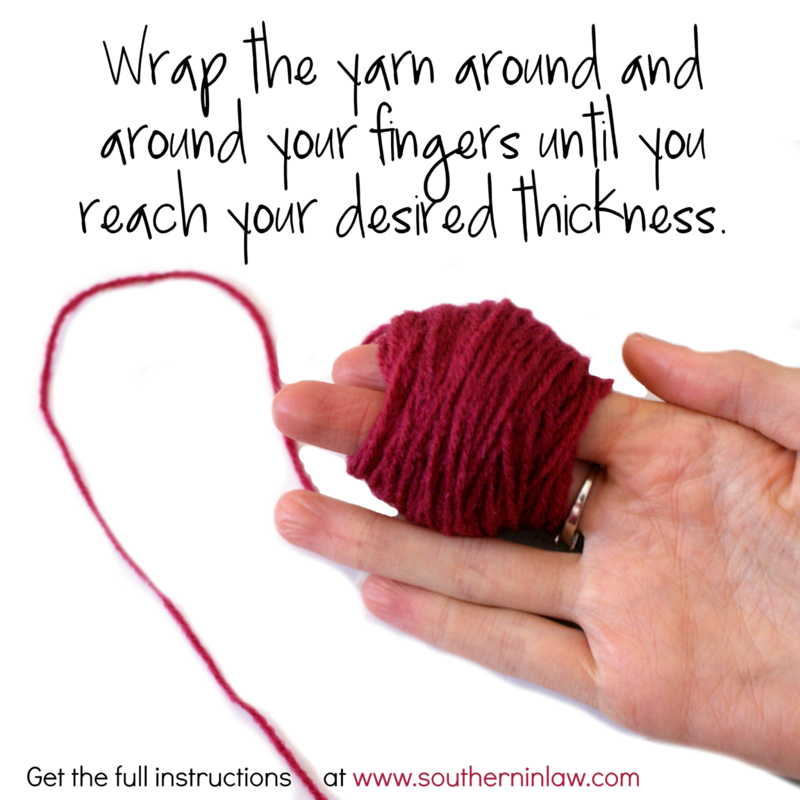 Once your pom pom ball is your desired thickness, cut your yarn and hold the loose end in place with your thumb. Also cut off an extra piece of yarn that's an inch or so wider than your yarn ball. 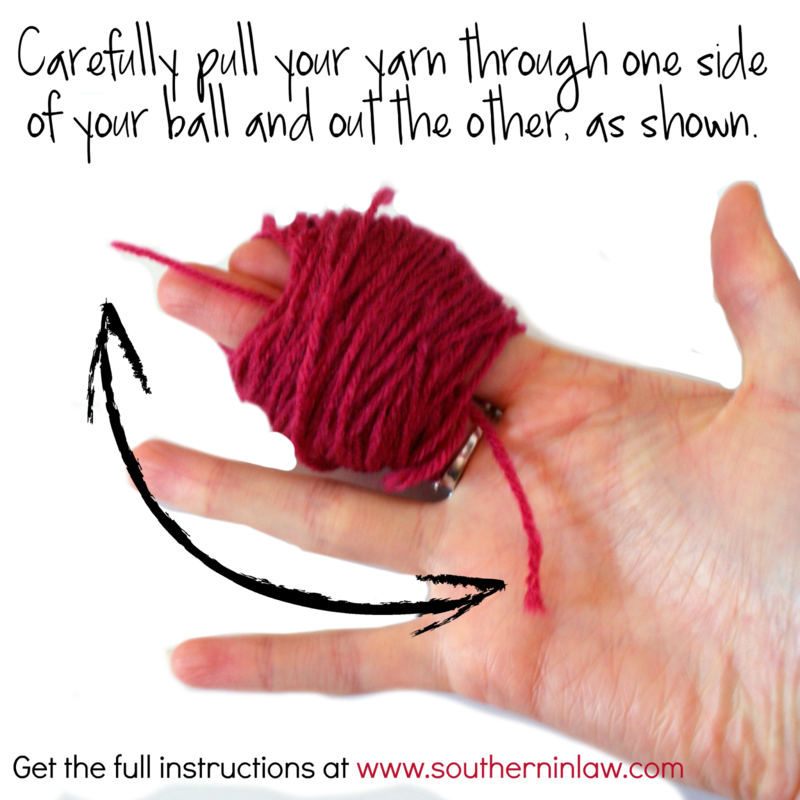 Take your extra piece of yarn and pull it underneath your yarn ball (on top of your fingers) and through the other side as shown. This is where you may need a knitting needle or pen to carefully push the yarn through to the other side. 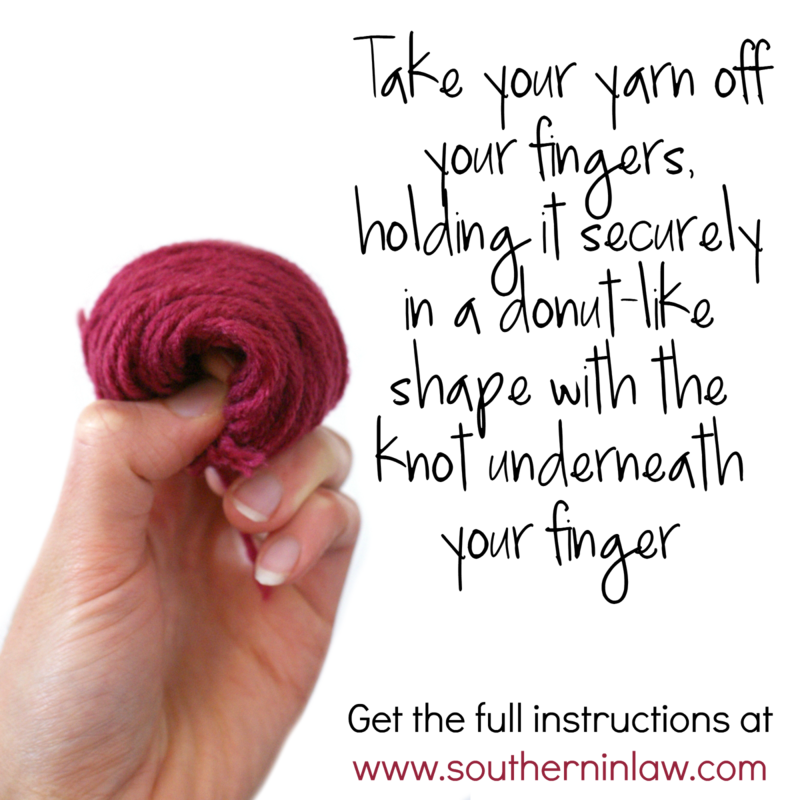 Take your yarn off your fingers, keeping a finger through the centre of your yarn bundle so you have a donut like shape. Now, holding the tied end underneath your finger, cut directly opposite the tied end as shown. 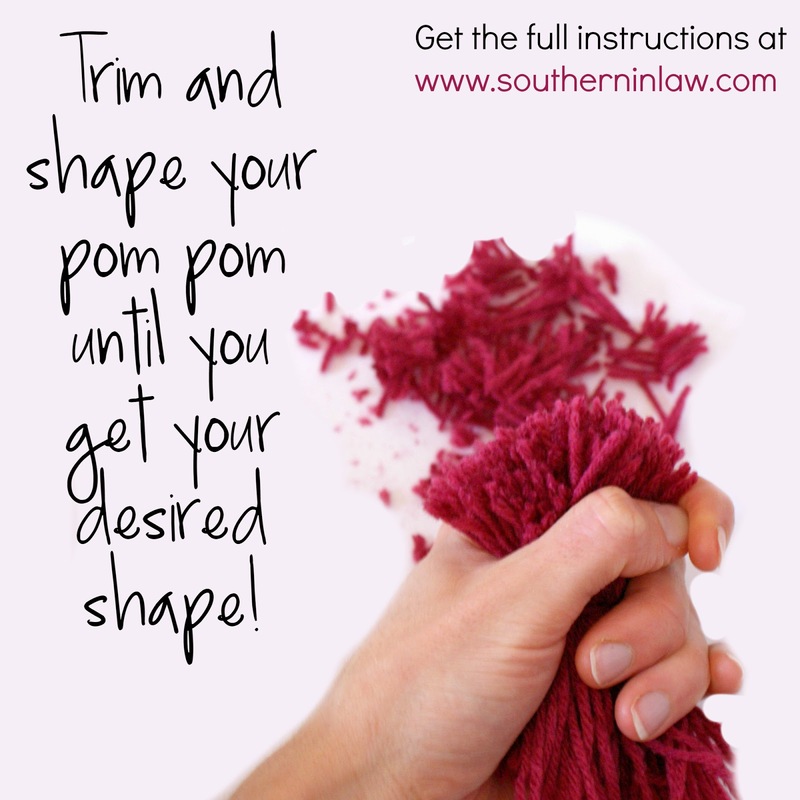 Now it's time to shape your pom pom! 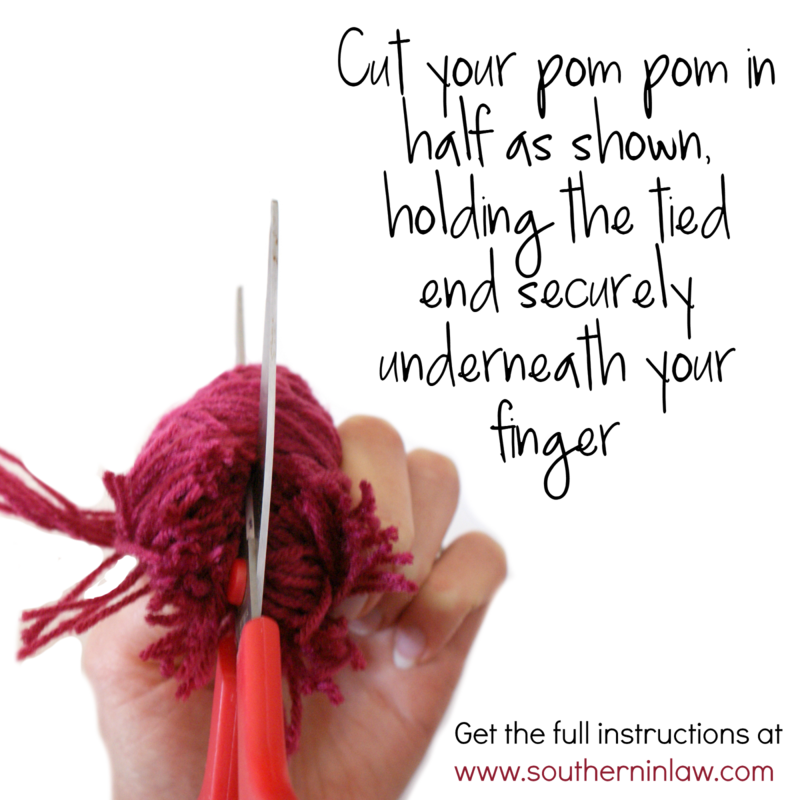 Trim your pom pom as needed, fluffing it out to see where else you need to trim. Once you've perfected your shape, you're ready to make another! I told Jesse this was my favourite part because I felt like I was a pom pom hairdresser ;) Just remember to trim bit by bit as you don't want to trim too much as you can't put it back on! Once you've created as many pom poms as you need for your garland, it's time to assemble! There's a number of options when it comes to assembling your pom pom garland - and you can either bunch the pom poms tightly together or separate them like we've done. The choice and look is completely up to you! Sew your pom poms onto your chosen cord/yarn by putting a through stitches through the middle of your pom pom and around whatever you are using as the base of your garland. Tie your pom poms onto your chosen cord/yarn by taking two strands at the back of your pom pom and carefully securing them to your cord/yard with a tight double knot. This way you can also move and adjust your pom poms by carefully pulling them across the cord/yarn. For our garland, we used a long piece of our white yarn to attach our pom poms to, tying then as described above in the colour pattern we decided on. And it really is super simple. For less than $10 and a couple of hours work whilst binge watching your favourite TV shows (I can't be the only one!) or catching up on a new DVD, you can have a pretty pom pom garland to brighten up your home. They're the perfect Mother's Day or Birthday Party decoration and can be made in any colour scheme to suit your home. So what are you waiting for! Get to pom-pom-ing, friends! But tell me, what was the last craft project you worked on? And what's one thing you wish you could do but just can't seem to grasp? And are you a knitter or crafter? Show off your crafty creations by sharing a picture in the comments below! Knitting and crocheting are the two crafts I just can't figure out - and I think it's mainly a patience thing. I also wish I could do a handstand or a cartwheel but with one not-so-great arm I don't think that's possible. This was a sponsored post for The Reject Shop by Southern In-Law. As always, all opinions shared are entirely Kristy's own and this project has been created and developed by Kristy and Jesse for The Reject Shop. To find out more about our sponsored posts, please contact us or take a look at our sponsored post information. This is great! I never would have thought to make pompoms like this!! Trying this this weekend as a Reject Shop just opened near us! MAKING THIS ON THE WEEKEND!!!!! You'll have to send us a picture of your finished project, Rhiannan!